Is Apple TV the next great gaming console? If you own a Mac—nay, if you own a computer—and watch a lot of downloadable video content, there’s a good chance you've given VLC Media Player a try. Media-junkie iPad owners can now rejoice, as the free, no-frills media player renowned for its ability to play just about any type of video codec in existence has finally made its way to the iPad. VLC, created by non-profit organization VideoLAN, is an open-source, cross-platform multimedia player and framework that plays most multimedia files and various streaming protocols, including Flash. Along with supporting nearly every codec out there, VLC can also play back damaged media files. Despite its power and versatility, VLC is remarkably simple to use, boasting a minimalist interface with its more complex options hidden deep in its menu system. Assuming this multifaceted media player works as well on the iPad as it does on Mac OS X, iPad users should be in for a real treat. 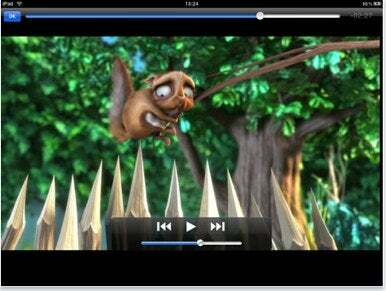 VLC Media Player for iPad is free and runs on iOS 3.2 or later.